CrunchGear is at CEATEC 2010, Asia’s biggest technology and electronics exhibition, which takes place yearly in Chiba (one hour away from Tokyo). Sharp’s booth was (next to 3D devices) all about Android, with its so-called Galapagos e-reader/tablet hybrids being not only the biggest attraction there but also one of the biggest of the entire exhibition. 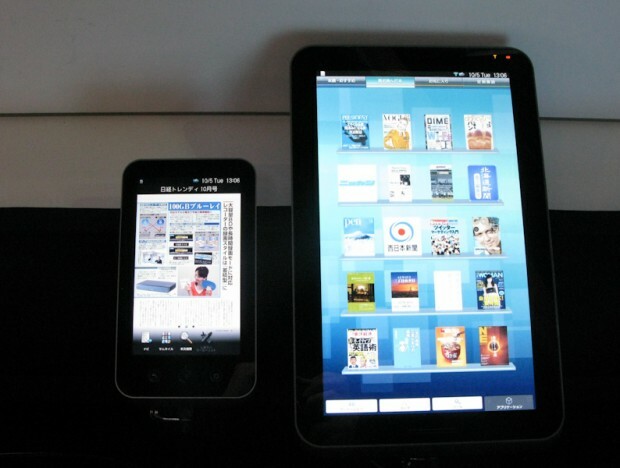 As reported last week, the reader will be available in a 5.5-inch and a 10.8-inch version. Japanese buyers will be able to buy both models in December (no word yet on international availability). I went hands-on with both versions, and while both tablets made a solid impression, they had one major problem: turning pages or zooming (and then moving the screen around) was just a little too laggy for my taste. It’s not terrible by any means, but noticeable and surely something to take into account in a device that’s marketed as an e-reader.